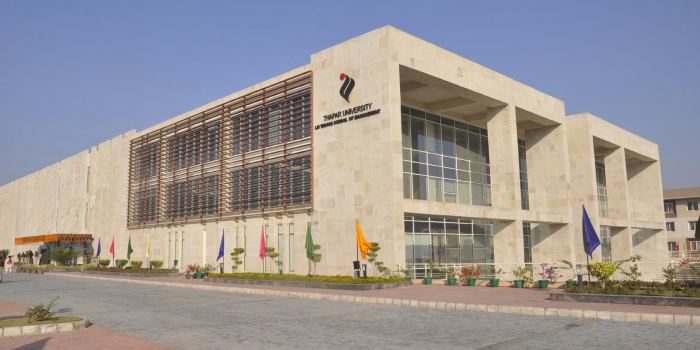 LM Thapar School of Management, Thapar University, Patiala has announced the admission for its two-year full-time Master of Business Administration (MBA) programme for the Academic year 2018-20. The institute offers regular MBA programme. The article will provide the information related to the course fee, application fee, eligibility criteria and more. Read the complete admission notification given below for MBA at LM Thapar School of Management. The mode of application is online/offline. The application fee for the programme is Rs. 1000. Candidates can either fill the application form online or take the printout of the form, fill it and send it to the admission department of the university. Candidates with a Graduation/Post-Graduation degree in any discipline with 50% in aggregate marks or CGPA or grade secured from any recognised University/Institute. Candidates with a graduate degree with a pass in all parts/sections of the Intermediate exams of CA/ICWA/ACS are also eligible to apply. Work Experience required (if applicable): Given due weightage during the Personal Interview. Candidates will be shortlisted on the basis of their CAT/XAT/NMAT by GMAC™/ GRE/ GMAT/CMAT/MAT/TU entrance exam score. Final selection will be based on CAT/XAT/ NMAT by GMAC™/ GRE/ GMAT/ CMAT/MAT/TU entrance exam score, Group Interaction and performance in Personal Interview. Your LM Thapar School of Management, Thapar Institute of Engineering and Technology, Dera Bassi brochure has been successfully mailed to your registered email id .